Global™ Acid Corrosive Cabinets Are Constructed Of All Welded, Double Walled 18 Gauge Steel With 1-1/2" Air Space. These acid storage cabinets feature dual 2" diameter flame arrestor air vents with caps. Double walled doors are made with 14 gauge steel outside and 18 gauge steel inside. Chemical storage cabinets have heavy duty piano hinges and 3-point locking doors for added security. 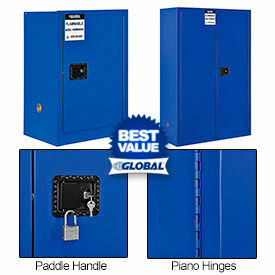 Global acid safety cabinets feature a flush mounted, paddle handle with cylinder and 2 keys. Galvanized steel shelves have 350 lb. capacity and adjust at 2-1/2" increments. Hazardous chemical storage cabinets include polyethylene tray liners for shelves and built-in ground connection which helps dissipate static charge. Safety storage cabinets feature 2" leak proof doorsills and adjustable leveling feet. 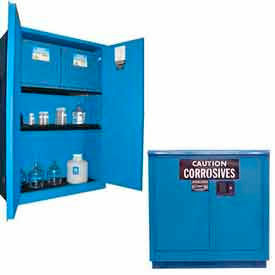 These acid corrosive cabinets have a blue powder coat finish and meet or exceed NFPA and OSHA requirements. FM approved. 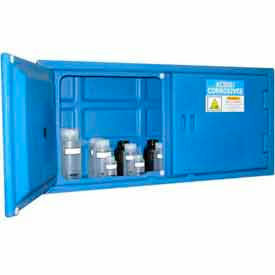 Eagle Acid Corrosive Safety Cabinets Keep Corrosives Of Various Sizes Safely Contained. 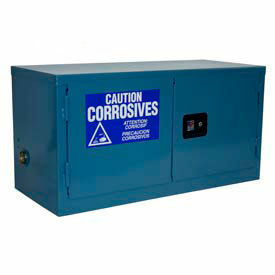 Corrosive safety cabinets are made using an all-welded body with reinforced double walls. 1-1/2 insulating air space on top, bottom, back, sides and doors. 2 vent with fire baffle and cap. All doors on safety cabinets are self-latching for secure closure. Three-point key lock with button latches for secure closure. Tri-lingual warning labels. 2 raised front sill prevents leaks. Corrosion-resistant powder coat finish. Poly shelves and trays help contain small spills for increased corrosion protection. All steel cabinets meet NFPA Code 30 specifications and OSHA requirements. 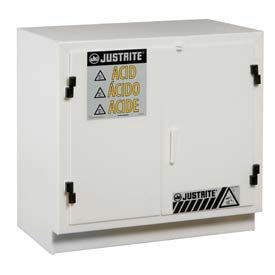 Justrite® Acid Corrosive Cabinets Are Designed For Secure, Convenient And Safe Storage Of Moderate And Flammable Corrosives. Justrite® Acid Corrosive Cabinets are made of solid 18 gauge all-welded steel for long lasting durability and dependability. Doubled walled construction with 1-1/2 inch insulating air space helps keep temperatures from rising. Built in grounding connector. Dual 2 inch vents can connect to an exhaust system. 2 inch depth leak proof doorsill contains spills. Doors have full length piano hinges. Recessed paddle handle with cylinder lock and padlockable latch for security. Stainless steel 3-point self-latching system provides positive door locking. Adjustable leveling feet for uneven floors. Durable blue powder coat finish with Haz-Alert® trilingual reflective warning label provides high visibility. 1, 2 or 3 quantity 350 lb. galvanized steel shelves on most models include polyethylene tray to protect from harsh chemicals and adjust at 3 inch increments and feature SpillSlope™ design that directs spills to back and bottom of cabinet. Comply With National Fire Protection Association specifications, OSHA regulations and are approved by The Factory Mutual System. Available in 17, 23, 23-1/4, 34 and 43 inch widths, 17, 18, 22, 24 and 34 inch depths and 18, 22, 24, 35, 44 and 65 inch heights with 4, 12, 15, 17, 22, 30, 45, 54, 60 and 90 gallon capacities. Securall® Acid & Corrosive Storage Cabinets Are Used For Small Classroom Audio Lessons. Securall® Acid & Corrosive Storage Cabinets are made of a reinforced 18-gauge steel all-welded body and painted galvannealed 18-gauge steel adjustable shelves for long lasting durability. Leak tight sump and shelves have removable corrosive-resistant polyethylene trays to provide containment of accidental spills, and acid cabinets are finished in corrosive-resistant urethane paint. Large warning label for extra security measures. Double wall construction with 1-1/2" air space, flush mounted locking handle, and three-point self latching (non sparking) doors provide additional security and containment. OSHA, NFPA Code 30 compliant. Fully assembled. Available types are Manual Close, Self-Close Sliding Door and Self-Close Safe-T-Door. Colors are Ag Green, Beige, Blue, Gray, Md Green, Red, White and Yellow. Number of adjustable shelves are 1 and 2. Gallon capacities are 24, 30, 45 and 60. Sizes vary per style. 1 Year Limited Warranty. Global™ Compact Chemical Storage Cabinets Are Designed To Easily Stack On Top Of Other Safety Cabinets For Increased Storage Capacity. Compact safety cabinets are easily placed on counter tops or on top of other safety cabinets. Made using all welded, double walled 18 gauge steel for superior strength. Cabinet doors are made with 18 gauge interior and 14 gauge exterior for increased strength and fire protection. Double walled steel features 1-1/2" insulating air space. Chemical safety cabinets meet or exceed the NFPA Flammable Liquid Storage Code #30 and the OSHA standard for storage of class I, II and III liquids. Dual 2" flame arrestor air vents can connect to an exhaust system to maintain safe temperatures. Safety storage cabinets include a built-in grounding connector and adjustable rubber capped leveling feet. Doors feature a self latching mechanism that engages 3-point locking without handle rotation. Highly visible trilingual warning sign on door helps warn personnel about possible danger. Heavy duty 4" hinges with sturdy brass pins provide extra security. Flush, paddle handle prevents accidental catching or banging. Hazardous chemical storage cabinets have a 2" leak proof door sill and a polyethylene tray liner to contain leaks. 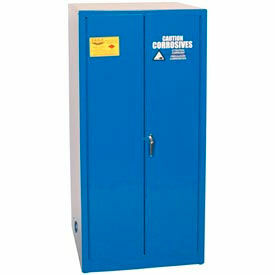 Safety cabinets have a blue powder coat finish and radius edges for safety. 10 Year Limited Warranty. 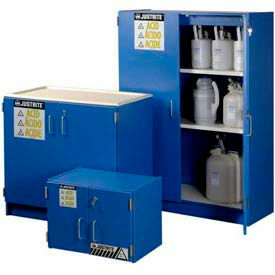 Justrite® Piggyback Chemical Storage Cabinets Provide Additional Safety Storage Without Taking Up Valuable Floor Space. Piggyback safety cabinets mount to top of Justrites standard 30 and 45 gallon acid corrosive cabinets and can also be placed on counter tops or stacked to provide additional storage (Note: cannot be used with sliding door cabinets). Double walled 18-gauge all-welded steel with 1 1/2" insulating air space. These hazardous chemical storage cabinets include a built in grounding connector. The dual 2" vents of these acid storage cabinets can connect to an exhaust system. Safety cabinets have a 2 D leak proof doorsill to contain spills. Doors have full length piano hinges. Justrite® Safety Cabinets have a recessed paddle handle with cylinder lock and padlockable latch for security. Stainless steel 3-point self-latching system provides positive door locking. Optional 350 lb Galvanized Steel Shelf features a SpillSlope design that direct spills to back and bottom of safety cabinet. Includes adjustable leveling feet for uneven floors. Durable powder coat finish with Haz-Alert trilingual reflective warning label provides high visibility. 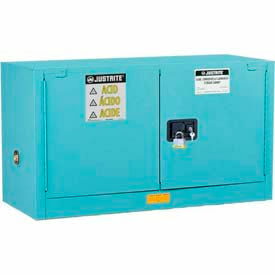 Justrite® Acid Corrosive cabinets comply with National Fire Protection Association specifications, OSHA regulations and approved by the Factory Mutual System. 10 Year Limited Warranty. Eagle Modular Quik-Assembly Acid Corrosive Poly Cabinets Are Designed For Storage Of Aggressive Acids Such As Nitric, Sulfuric and Hydrochloric Acid. Eagle Modular Quik-Assembly Acid Corrosive Poly Cabinets include 2 poly vents with caps for long lasting use and proper ventilation. Caution Corrosives labels are included. Sealed internal containment sump and top spill sumps prevent leaks. Durable lockable doors provide secure closure and can be assembled to open form the left or right side. Available capacities are 4, 24, and 48 gallons. Include 2, 4 or 8 Shelves. Dimensions vary per model. Polyethylene Chemical Storage Cabinets Offer Superior Protection against Acids and Corrosives. Polyethylene Chemical Storage Cabinets are solidly made for long lasting durability and dependability. Justrite brand offers One Door Safety Cabinet that sits on countertops for convenient, compact storage. Door hinges on either right or left hand side. Polyethylene tray shelf catches leaks and additional pullout tray serves as a work surface. Two Door Safety Cabinet fits under counter tops. Includes 2 separate compartments with adjustable polyethylene shelves. Separate pullout sumps underneath storage cabinet capture accidental leaks. Dimensional sizes vary per model. Justrite® Polyethylene Acid Corrosive Cabinets Offer Superior Protection Against Harsh Acids, Rust & Corrosion. Justrite® Polyethylene Acid Corrosive Cabinets are are made using sturdy, chemical resistant solid-walled high density polyethylene. Sealed, all-welded 2" sump on bottom contains leaks and spills. Used for storing highly aggressive liquids such as phenol, nitric acid and sulfuric acid. Plastic safety cabinets feature external 2" NPT vent/exhaust connections. Doors include padlockable hasps for security and Haz-Alert™ trilingual reflective warning labels. Adjustable leveling feet for uneven surfaces. Countertop Cabinet easily sits on table tops, counters and desktops for convenient, compact storage. Undercounter and Stand Alone Cabinets include a 3-point door latching system and one height adjustable shelf. Shelf adjusts at 3" increments and is sloped to the back to direct spills toward the rear. Justrite® ChemCor® Lined Safety Acid Corrosive Cabinets Offer Superior Corrosion Protection Combined With Fire Protection. 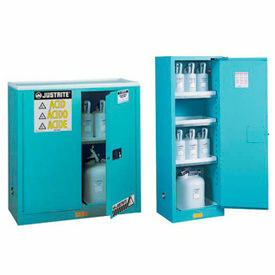 Justrite® ChemCor® Lined Safety Acid Corrosive Cabinets are made of double-wall, 18-gauge (1mm) welded steel for strength and long lasting durability. 100% seamless liner on all interior walls, ceiling, sump, inside doors and shelves protects exposed cabinet surfaces from rust and corrosion. Seam-free surface eliminates need for rivets or fasteners which risk corrosion from seep-through chemicals. Non-porous surface resists staining and cleans-up easily. Designed with 2 inch (51mm) liquid-tight containment sump, dual vents, adjustable shelves, three-point stainless steel bullet self-latching doors with U-Loc™ padlockable handle and Haz-Alert™ reflective warning labels. Interior ChemCor® liner ensures complete corrosion resistance and protection. All ChemCor® lined safety cabinets include two labels to be placed on cabinet by end user: Base or reflective Haz-Alert™ Acid depending upon contents stored. Shelving adjusts on 3 inch (76mm) centers for storage versatility. 30 gal (110L) 2-door models include extra polyethylene work tray which can be secured to cabinet top for work surface. Color is Blue. Dimensions vary per style. Door types are Manual Close, Self Close and Self Close/Sliding Door. Door quantities are 1 and 2. 10 Year Limited Warranty. Justrite® ChemCor® Lined Compact, Countertop And Undercounter Acid Corrosive Cabinets Offer Corrosion Resistance And Fire Protection. Justrite® ChemCor® Lined Compact, Countertop And Undercounter Acid Corrosive Cabinets are made of double-wall, 18-gauge (1mm) welded steel with specially-formulated, baked-on powder coat paint for extra resistance to deterioration from harsh chemicals and long lasting durability. 100% seamless liner on all interior walls, ceiling, sump, inside doors and shelves protects exposed cabinet surfaces from rust and corrosion. Seam-free surface eliminates need for rivets or fasteners which risk corrosion from seep-through chemicals. Non-porous surface resists staining and cleans-up easily. Offers complete protection from harsh acids and corrosive chemicals plus fire protection and code compliance of Justrite's steel safety cabinets. All models meet OSHA and NFPA regulations and most are FM approved. Self-closing models also comply with International Fire Code and/or NFPA 1 Fire Code™. Styles are Compact, Countertop, Under Fume Hood and Undercounter. Colors are Blue, Light Neutral and Silver. Dimensions and gallon capacities vary per style. Door types are Manual Close and Self Close. Door quantities are 1 and 2. 10 Year Limited Warranty. Justrite® ChemCor® Lined Safety Piggyback Acid Corrosive Acid Cabinets Offer Complete Protection From Harsh Acids, Corrosive Chemicals And Fire. 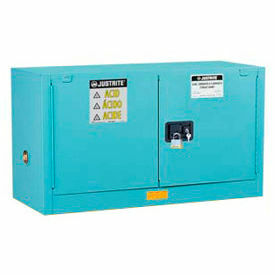 Justrite® ChemCor® Lined Safety Piggyback Acid Corrosive Acid Cabinets are made of double-wall, 18-gauge (1mm) welded steel with specially-formulated, baked-on powder coat paint for extra resistance to deterioration from harsh chemicals and long lasting durability. 100% seamless liner on all interior walls, ceiling, sump, inside doors and shelves protects exposed cabinet surfaces from rust and corrosion. Seam-free surface eliminates need for rivets or fasteners which risk corrosion from seep-through chemicals. Non-porous surface resists staining and cleans-up easily. Offers complete protection from harsh acids and corrosive chemicals plus fire protection and code compliance of Justrite's steel safety cabinets. Designed with 2 inch (51mm) liquid-tight containment sump, dual vents, adjustable shelves, three-point stainless steel bullet self-latching doors with U-Loc™ padlockable handle and Haz-Alert™ reflective warning labels. Interior ChemCor® liner ensures complete corrosion resistance and protection. All ChemCor® lined safety cabinets include two labels to be placed on cabinet by end user: Base or reflective Haz-Alert™ Acid depending upon contents stored. Shelving adjusts on 3 inch (76mm) centers for storage versatility. 30 gal (110L) 2-door models include extra polyethylene work tray which can be secured to cabinet top for work surface. Capacities are 12 gallons and 17 gallons. Color is Blue. Sizes are 43 in. W x 18 in. D x 18 in. H and 43 in. W x 18 in. D x 24 in. H. Door types are Manual Close and Self Close. Door quantity is 2. 10 Year Limited Warranty. 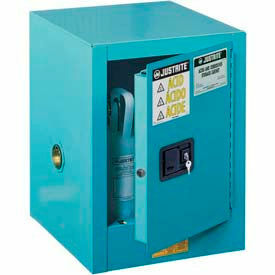 Justrite® High Security Acid Cabinets Provide Added Storage Safety In High Risk Environments. Justrite® High Security Acid Cabinets are made of double walled 18-gauge all-welded steel and powder coat finish with Haz-Alert™ trilingual reflective warning label for high visibility and long lasting durability. Provides higher level of security than other flammable cabinets with security bar that padlocks at both ends in addition to manual built-in door lock. Design allows 1-1/2 inch insulating air space and dual 2 inch air vents that connect to exhaust system to maintain safe temperatures. Includes built-in grounding connectors and leveling feet. 350 lb. capacity shelves easily adjust on 2-1/4 inch centers. Doors feature spill-proof sill, recessed easy grip handle, long wearing piano hinges for smooth closure, 3 point locking system and highly visible trilingual warning label. Accepts No. 5 Master Locks. Set of two keyed-alike locks sold separately. Meets or exceeds NFPA Flammable Liquid Code #30, OSHA standard 1910.106 for storage of class I, II and III liquids and FM approved. Styles are Compact, Slimline and Wall Mount. Capacity is 45 gallons. Color is Blue. Size is 43in. W x 18 in. D x 65 in. H. Door types are Manual Close and Self Close. Door quantity is 2. 10 Year Limited Warranty. 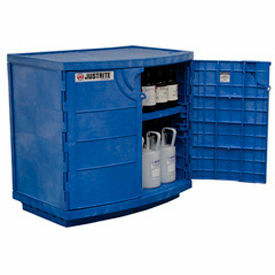 Justrite® Blue Wood Laminated Acid Storage Cabinets Are Designed To Store Aggressive Corrosives. Justrite® Blue Wood Laminated Acid Storage Cabinets are made of wood laminate for strength and long lasting durability. Suitable for highly corrosive liquids such as phenol, nitric acid and sulfuric acid. Stainless steel handles and hinges resist corrosion from harsh acids. Shelves adjust on 1-1/4 inch (32mm) centers to accommodate wide variety of containers. Includes adjustable leg levelers, patent pending Haz-Alert™ reflective labels, and double key set for safety and security. Undercounter model also used free standing and includes removable, easy-to-clean polyethylene work surface top, recessed 5/8 inch (16mm) to help contain incidental leaks. Styles are Countertop and Undercounter. Color is Blue. Dimensions vary per style. Door type is Manual Close. Door quantity is 2. 1 Year Limited Warranty. SciMatCo Acid/Base Polyethylene Cabinets Are Used For Corrosion-Free Storage Of Hazardous Materials. SciMatCo Acid/Base Cabinets are made of plastic to prevent corrosion, and features a 2" liquid-tight welded bottom to contain accidental spills. Cabinets are clearly marked "Acid" or "Base" for immediate identification. SciMatCo Acid/Base Cabinets are available in Floor or Countertop styles, and come in single or double door models. Choose from a variety of sizes. SciMatCo Acid/Base Polyethylene Cabinets meet OSHA standards for secondary containment. 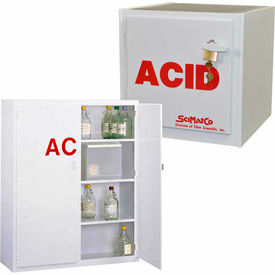 SciMatCo Metal-Free Plywood Acid Corrosive Cabinets Are Used For Safe Storage Of Hazardous Materials. SciMatCo Metal-Free Plywood Acid Corrosive Cabinets are made with a 1" multi-ply exterior-grade plywood, and feature a cabinet floor constructed as a 2" liquid-tight trough. Cabinets feature an internal metal lock on flammable compartments, and a plastic padlock hasp on corrosive compartments. All SciMatCo Metal-Free Plywood Acid Corrosive Cabinets meet or exceed all applicable NFPA and OSHA standards. Available styles are Acid Cabinets, Base Cabinets, Corrosive Cabinets, Acid/Base Combination Cabinets and Acid/Flammable Combination Cabinets. Acid/Flammable Combination Cabinets feature self-closing cabinet doors on the flammable side to meet Uniform Fire Code standards. 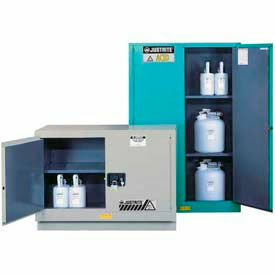 SciMatCo Metal-Free Plywood Mobile Acid Corrosive Cabinets Are Used For Corrosion-Free Storage Of Hazardous Materials. SciMatCo Metal-Free Plywood Mobile Acid Corrosive Cabinets are made with 1" multi-ply exterior-grade plywood that will never rust or corrode. Cabinet floors are constructed as a 2" liquid-tight trough. Cabinets labeled "Corrosive" are made with plastic hasp and padlock, and cabinets labeled "Flammable" feature an internal metal lock. SciMatCo Metal-Free Plywood Mobile Acid Corrosive Cabinets include locking casters. 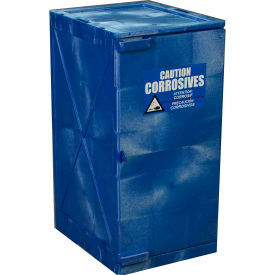 Corrosive Cabinet is blue with "Corrosive" labels, and is ADA-approved. 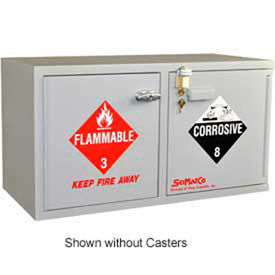 Flammable Corrosive Cabinet is gray with "Flammable" and "Corrosive" labels. 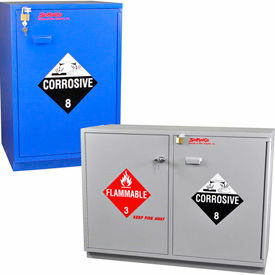 Both SciMatCo Metal-Free Plywood Mobile Acid Corrosive Cabinets meet OSHA standards. Justrite 2 x 4 Liter Bottle,1 Door, Countertop, Poly, Acid Storage Cabinet,14-1/4"x 16-1/4"x 19-1/2"